VSS problemen tijdens de AhsayOBM/ACB backup : Cloud2 B.V. Exclusively opened file on a local hard disk cannot be backed up. Many underlying components in the operating system may come into play during the backup process, to cause the VSS error. 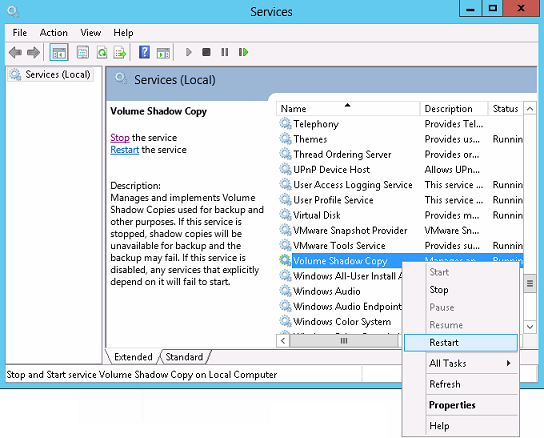 This article offers a guideline to troubleshoot errors related to Volume Shadow Copy. Have you restart the affected computer recently? Try rebooting the affected machine. In some instances, servers that have not been rebooted in a while may cause VSS malfunction. Reboot your server regularly as a preventive and cleanup measure for your system. Open Services.msc, click Control Panel, double-click Administrative Tools, then double click Services. Right click Volume Shadow Copy, then Restart. Restart the following related Windows Services as well: COM+ Event System, COM+ System Application, MS Software Shadow Copy Provider and Remote Procedure Call (PRC). In an administrative command prompt, execute the 'RegisterVSS.bat' script file available in the AhsayOBM installation home, reboot the machine afterward. Important: You can safely ignore the error message(s) displayed during the process, some of the DLL files are platform specific. Have you installed the latest Windows Updates on the affected computer? Are the COM+ catalog on the affected computer damaged? In some cases, Visio, which is part of Microsoft Office 2003 can cause Volume Shadow Copy to fail. Leverage the event logs found under Event Viewer. Important: All writer should have status of  Stable. If no provider is listed, there may be issue with the installation of operating system itself. Resolution should be pursued with Microsoft support staff. This will clean up all VSS snapshots. Defect operating system may often accumulate hundreds of VSS snapshots that persist in the system and cause Windows to become un-responsive. If there is no VSS writer error displayed, but the system is not creating a new VSS snapshot, increase the max shadow storage size on the system instead. Problem persist after going though all steps outlined above? Issue related to the Volume Shadow Copy (VSS) Windows services, or the Windows operating system itself should be further pursued with Microsoft support staff.